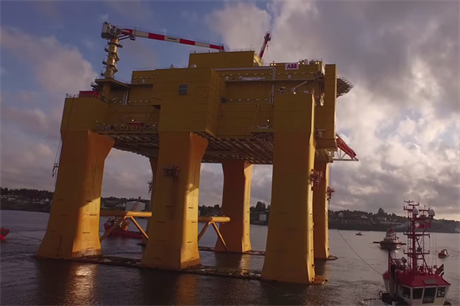 NORWAY: The converter station for the DolWin 2 grid link has left the Haugesund shipyard in Norway to begin its journey to the German North Sea. The platform had been in Norway for approximately one year after being manufactured in Dubai. In Norway, local firm Aibel and Swiss electricals supplier ABB installed the electrical systems and carried out testing. Construction of the converter platform for the 916MW DolWin2 offshore cable system to shore was completed in June 2014. The 101-metre long, 74-metre wide and 90-metre high platform weighs 23,000 tonnes and is one of the largest converter platforms in the world. According to transmission operator Tennet, the DolWin2 system will connect Dong Energy’s Gode Wind 1 and 2 projects, currently under construction 45 kilometres off the German coast. They are due to be connected in 2016.